; $349.99 Toshiba, Satellite L75-B7270, 17.3″ Laptop, 4GB Memory, 500GB Hard Drive, Intel Pentium, Windows 8.1; $99.99 Linksys RE6500 Range Extender; 30% off All audio products; $299.99 Canon imageCLASS MF6160dw Mono Laser All-in-One Printer; 50% off All Canon photo paper; $19.99 Brother PT-90 personal labeler; save $10 Any new phone regularly priced $49.99 and above; 20% off K-Cup® packs; $10 Staples invisible tape, ¾”, 10/pack; 30% off Your $50 purchase of packing and mailing supplies; $479.99 HP, Pavilion 23-g116 All-in-One, 23″, 500GB Hard Drive, 4GB Memory, Intel Pentium; $169.99 Dell 24″ LED-Backlit LCD Monitor; $5.99 Coffee filters commercial, 500; $12.99 Starbucks Veranda blend blonde coffee K-Cups, 16/box; $149.99 WD My Cloud 2TB Personal Cloud Storage; $19.99 Logitech M310, M317 or M325 wireless mouse; 50% off Fellowes Office Suites under-desk keyboard drawer with Microban; $79.99 D-Link DCS-5020L Pan & Tilt Day/Night Network Camera; $137.99 Ameriwood Carson Cube Desk w/ Low Hutch, Resort Cherry. 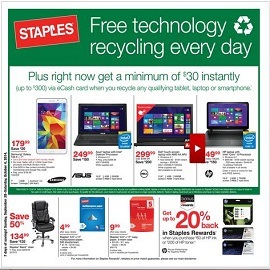 Staples stores activate their latest weekly circular every Sunday. Check back often for new coupons and weekly ads.